Gott Heart Art: Artful Creations Challenge #71 "Q"
I've been able to Zentangle among all the general living and finally this evening I was able to take pictures and now will be able to post and enter 4 challenges. I wish more people would be able to fit this challenge in their schedule. I missed last week so only 2 people entered. 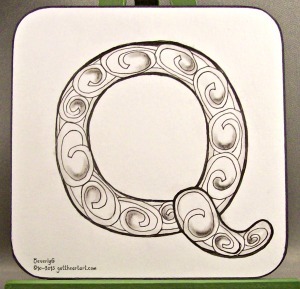 The challenge is going through the alphabet and this week is "Q". I decided to do a monotangle with the tangle Qian-long by: Diane Tai,CZT. After I got it tangled and shaded it looked very crisp and clean so I decided to leave things alone. The challenge begins each Tuesday so if you've got a few minutes in the next couple of days tangle a "Q" with one or more tangles beginning with "Q" and join in on the challenge. Love your tile. Good job!